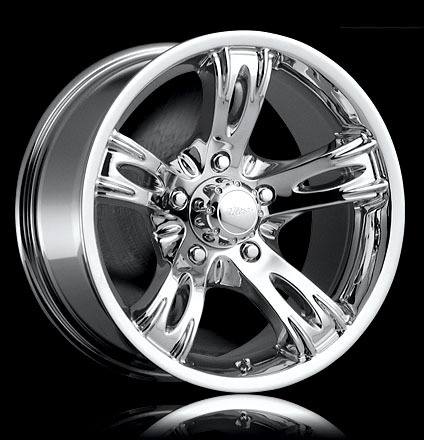 For over 20 years, Ultra Wheel Co. has been producing custom wheels for cars, trucks and SUVs. Ultra Wheels vary in size from 14 to 26 inches and come in over 50 different styles for even the most discriminating buyer to choose from. Quality through technology, state-of-the-art tooling, leading-edge design and the latest manufacturing methods. All Ultra Products are tested to meet SAE J2530 Automotive Aftermarket wheel specifications. Chrome Plating is tested to meet or exceed Cass 66 Hour Test. Some product models feature Ultra Finish for extra luster and quality. Akita Racing | Akuza Road Concepts | Alba | American Eagle Wheels | American Racing | Asanti | Asanti Black Label | ATX Series | Avenue | Baccarat | Ballistic Offroad | Bazo | Black Ice Alloys | BMF | Bonetti | Cali Offroad | Carroll Shelby | Cattivo | Concept Neeper | Dcenti | Detroit | Devino Road Concepts | Diamo | Diablo | DIP | Divinity | Divinity Racing | Dolce | Double-G | Driv / Driv Offroad | DUB | DV8 Off Road | D'Vinci | Enkei | Envy | F5 | Factory Reproductions | Fierro | Focal | Foose | Forte | Forza | Fuel Off-Road | Gazario | Gianelle Designs | Gino | Giovanna | Giovanna Forged | Gitano | Golden | Helo | Hildebrandt | Hoyo | Hostile Wheels | Ice Metal | ICCE | Incubus Alloys | ION Alloy | ION Forged | Ion Alloy Trailer Wheels | Jaagruti | Jesse James | Katana | Ka-Rizzma | KMC | KOKO KUTURE | Lexani | Lorenzo | Martin Brothers Alloy | Mayhem | Mazzi | Menzari | Merceli | Method Race Wheels | MHT | Milanni | Milano | Mizati | MKW | Motegi Racing | Moto Metal | MOZ | MPW | Niche | Ninja | OE Creations | OEM Replicas | On The Edge Marketing | Paladin | Panther | Pinnacle | Platinum | Poison Spyder | Polo | Primax | Pro Comp | Quantum Tek | Racing Power | RBP | Red Sport | Replicas | REV | RPM | Rucci Forged | Sacchi | Scorpion Offroad | Sendel | Speedy | TIRES | Tyfun | U2 | Ultra | Vagare | Valente | VCT | Veloche | Velocity | Venti | Venti Plus | Verde | Versante | Vintage Wheels | Viscera | Vision | V-TEC | Weld Racing | Worx | Wheel Replicas | XD Series | XPower | XON | XXR | Zane | Zenetti | ... and many more!